The Missouri Mom: There is something we all like about a Pickup Man! There is something we all like about a Pickup Man! I think there is something that excites us all about “Boys and their Trucks”, but there is nothing more exciting than a good old fashion truck pull! A few weeks ago introduced my little man (Dillard who is 3) to the excitement of a truck pull, and today I heard him reenacting his version of the truck pull on my living room coffee table. Nothing sweeter than a 3 year old boy shirtless and sporting his cowboy boots on the wrong feet racing miniature monster trucks across your coffee table! These boys and their trucks don’t put on a miniature show; this is a real show and so worth a drive to watch. I know very little about how truck pulls work and how they judge who wins, but I know this is a serious operation. I sat in the stands and admired how serious these “boys and their toys” are about the pulls. With names like “Yellow Fever”, “Plum Crazy”, and “Old Faithful” you can really appreciate the pride they take in their trucks and their race. I could also admire the crowds these truck pulls bring in; to be honest I would have thought there was a parade in town or something. I am not sure I have ever seen so many jacked-up pickup trucks backed up in a row in my entire life! Everyone should take a moment to check out the Inlaw Outlaw Sledteam’s website and even better catch them and all their friends at their next truck pull on Saturday, May 21 starting at 2pm in Silva Missouri. This will be an all around family event no coolers and no alcohol allowed! Wayne County 4-H will be providing the concession stand, so this can also be a good way to support the local youth! It is $7.00 for adults and $5.00 for kids under 12. There will be about 9 different classes of trucks and if the weather is good they say there should be a lot of trucks participating in the pull. 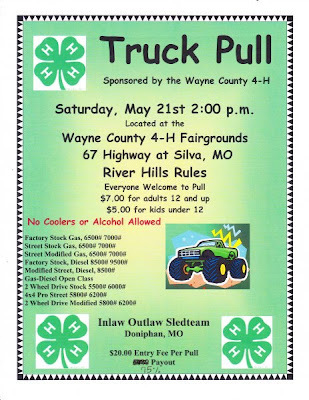 If you are a kid at heart and wish to enter your truck in the pull it is $20.00 per pull and you can check out the flyer I have attached or the Inlaw Outlaw Sledteam’s website. Please check out our website and magazine: http://www.wheel-emag.com and let us know if you would be willing to write an article for us on that truck pull. Our email is wheelemag@gmail.com.